Along the river IJssel in the east of the Netherlands a number of towns still have a more or less medieval inner city, with both civil and ecclesiastical buildings. 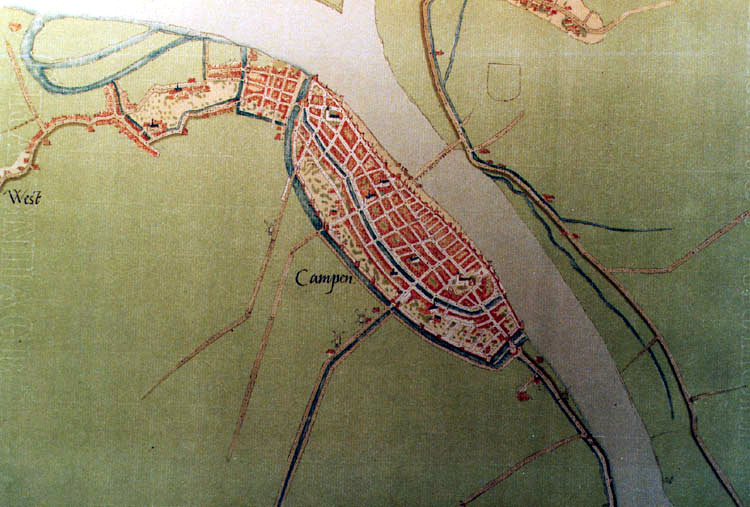 Cities such as Kampen, Zwolle, Deventer and Zutphen are not completely unfamiliar to historians thanks to their place in the history of the fourteenth-century reform movement in the Catholic Church, the Devotio Moderna. They played a subordinate but not neglectable role, too, within the Hanseatic league. The famous series of maps of cities in the Low Countries by Jacob van Deventer, a cartographer from Kampen, came into existence thanks to a request in 1558 by the Spanish king Philipp II. The surviving maps have been digitized in the Biblioteca Digital Hispánica of the Biblioteca Nacional de España in Madrid. Kampen is the city closest to the end of the IJssel river. Five medieval city gates have survived the centuries. The town-hall from 1350 was hit by a fire in 1543. 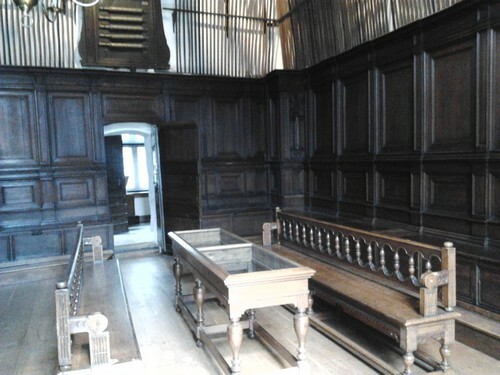 The courtroom had to be completely refurbished, and this was done in an indeed lavish way. Its rare unharmed survival makes this rather small building more important than you would guess from the outside. Until 2001 it was used by the city, and now it is part of the Stedelijk Museum Kampen. The way justice and city power are represented in the main room at the first floor, which was both court room and council room, is exemplary. A visit to this space amounts to a kind of pilgrimage for legal iconography. Within the space of a short post I can only focus on a few aspects of a building that deserves close inspection and study. From the outside one can immediately notice the double function of the building. Barred windows give the building an austere image. On one side six sculptures kept a watch. Alas the figures of Charlemagne and Alexander the Great and allegoric personifications of Justice, Charity, Temperance and Fidelity had to be replaced by modern sculptures; the remains of the original sculptures can be seen at the Koornmarktspoort, one of the city gates. Wim van Anrooij, a reknown medievalist and specialist on the history of the Nine Best, doubted the identification of Charlemagne in ‘Beeldvorming in taal en steen ten stadhuize: Alexander en Karel de Grote (of Julius Caesar?) in Kampen’, Kamper Almanak (2002) 50-65. Inside the town-hall much more is to be seen than I will present here. In a room adjacent to the Main Room you will find a fine exhibition of numerous objects from the history of Kampen as a proud city which could keep its independence until 1795. The Main Room of Kampen’s town-hall is rather dark, and perhaps thus the white mantelpiece created in 1545 by Colijn de Nole from Cambrai attracts even more attention than it does already on its own. 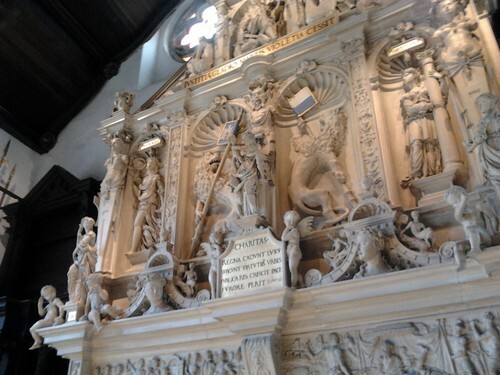 To the left an elaborate wooden structure with a painting of the Last Judgment is almost insignificant. I will point out its beautiful elements later on. Central to the superb mantelpiece are a number of allegorical figures. In the midst you can see from the left to the right the figures of Spes, Caritas and Fides, hope, charity and fidelity, the three central virtues of faith. The Latin text below the central statue states that kingdoms fall due to luxury, cities prosper because of their virtues, the public interest grows by peace, and perishes by folly. Between the top part and the main part a scroll with another text in Latin focuses on justice, “The violence of Mars cedes before the sword of justice”. Four smaller statues represent Justice, Peace, Prudence and Temperance, four cardinal virtues. The eagle, symbol of the Holy Roman Empire and their Habsburgian rulers, crowns the very top of the mantelpiece in splendid Renaissance style. The freezes show both scenes from Roman history and from the Bible. The left freeze pictures the Judgment of king Solomon (1 Kings 3,16-28). By now it should be clear that by focusing on the main elements I skip the very details which make this object so stunning. The putti, the two lions with the city blazons, the smaller heads, the use of perspective in the niches, the way persons are dressed, and the smaller reliefs all deserve, nay, need attention if you want to interpret the iconographic program of this showpiece convincingly. 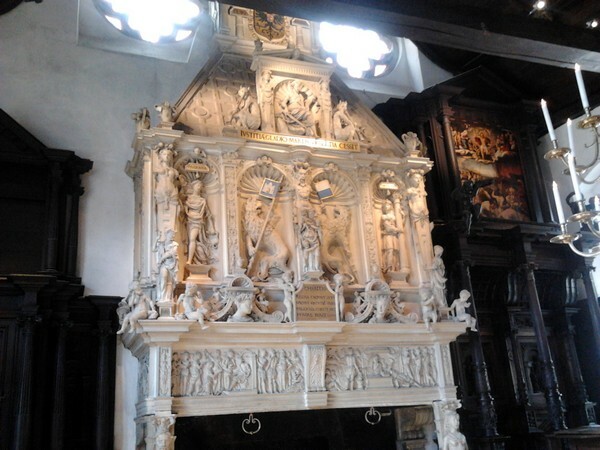 To mention just one element that has to be considered, you cannot understand this mantelpiece properly without acknowledging the fact that specifically in the city of Utrecht late medieval mantelpieces used to be adorned by elaborate freezes. Colijn de Nole had connections with Utrecht. The medieval diocese of Utrecht covered large parts of the Netherlands, including the cities on the IJssel. The recent exhibition Ontsnapt aan de beeldenstorm [Escaped from the Iconoclastic Tempest] at Museum Catharijneconvent in Utrecht showed a surprising number of mantelpiece freezes, many of them from the Centraal Museum in Utrecht, see the exhibition catalogue Middeleeuwse beeldhouwkunst uit Utrecht 1430-1528 [Medieval sculptural art from Utrecht 1430-1528] (Utrecht: Museum Catharijneconvent; Antwerp 2012). Some of De Nole’s work is charted in Medieval Memoria Online, a new database at Utrecht University on medieval memorial and funeral art in the Netherlands. However, apart from an exhaustive inspection of all details, it is necessary to look at the other objects, and to view the mantelpiece as a part of a room with a double function, both court room and council room. 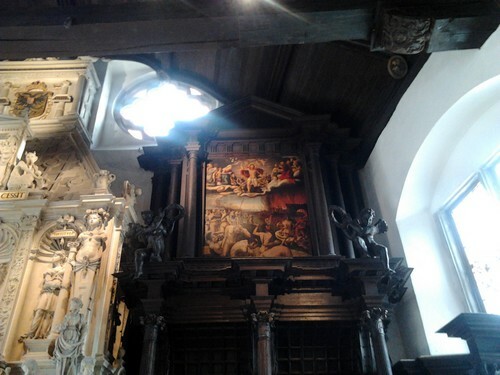 The wooden structure – in fact it is the seat of the judges – with at its top a painting of the Last Judgment by Ernst Maler can boast some fine carpentry by Meester Frederik, but it is not up to the standards set by Colijn de Nole. Its dimensions are really small compared to the mantelpiece. 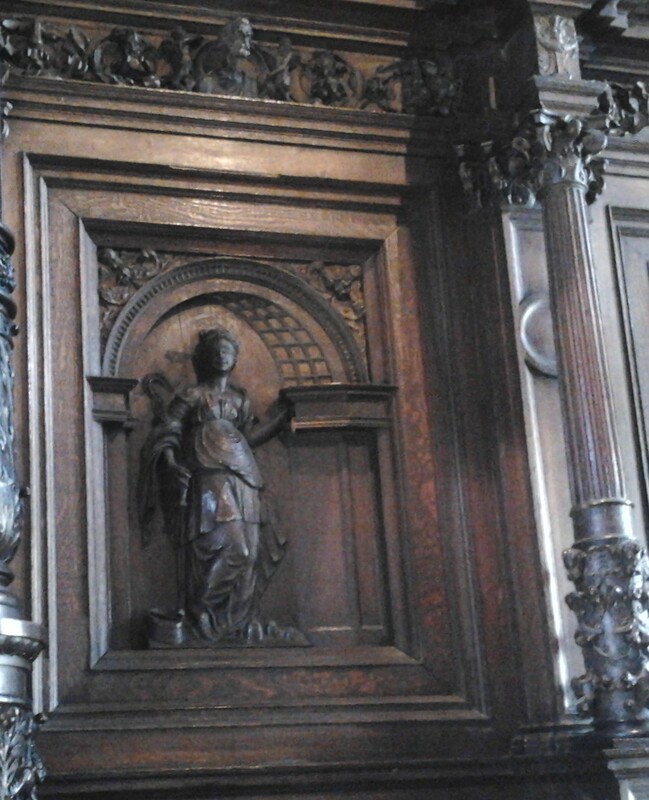 In fact the wooden edifice prevents you to have a good look at the right side of the mantelpiece, where you can only guess that the statue must represent Temperance. 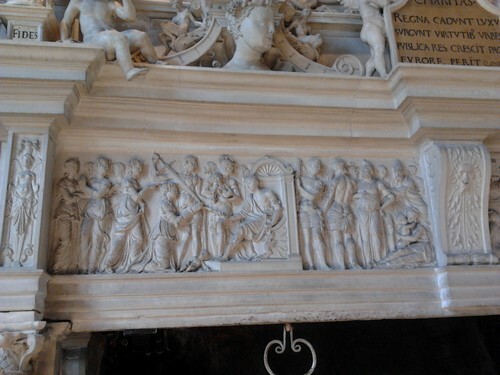 Another detail of the woodwork is also relatively small, a finely detailed relief with an allegory of Justice. I could point out its position below a canopy or the way Renaissance style does influence even a lesser artist, but all these things can speak only when you bring them into a coherent view of all objects in this room. The most recent monograph on Kampen town-hall was published almost 25 years ago, A.J. Gevers and J. ten Hove, Raadhuis van Kampen (Zwolle 1988). At least one art historian has looked recently in close detail at the materials De Nole used for the mantelpiece [Trudy Brink, ‘Spiegel voor stadsbestuur nader onderzocht : over de schouw van Colijn de Nole in Kampen’, Bulletin KNOB 108 (2009) 183-193, 222-223 (with a summary in English)]. The title of this article states the mantelpiece formed a kind of mirror for the city council. I was not able to find more recent studies on it in the database of the former Dutch center for legal iconography at the Royal Library in The Hague. You can find some eighty images concerning Kampen from this collection at The Memory of The Netherlands, the portal to more than hundred Dutch digital collections. Let’s turn to the other half of the room. 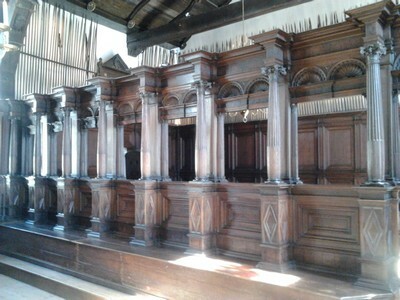 Spectators were allowed to watch the proceedings of a trial from this part of the room. Along the walls you find a mass of spears, a graphic reminder of the city’s power. 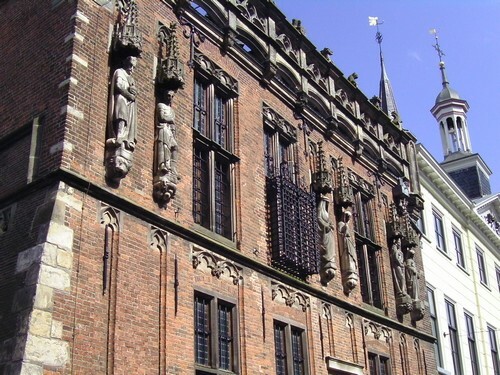 The door in the center opens to the Tower of the Échevins (Schepentoren), the oldest part of the building. In 2014 the Dutch legal history journal Pro Memorie, published by the Foundation for the History of Old Dutch Law will publish as a special issue a volume on legal iconography with the title Rechtsgeschiedenis in beeld, “looking at legal history”. In the call for papers legal historians are invited to write contributions on legal iconography from the widest possible perspectives, be it artists’ contracts, the use of colors or forbidden art. Every year Pro Memorie has space for some contributions from the field of legal iconography. I look forward to the volume that will be published in 2014 for the fifteenth anniversary of this journal. No doubt Dutch and Flemish town-halls and their interiors, too, will figure in the new book. 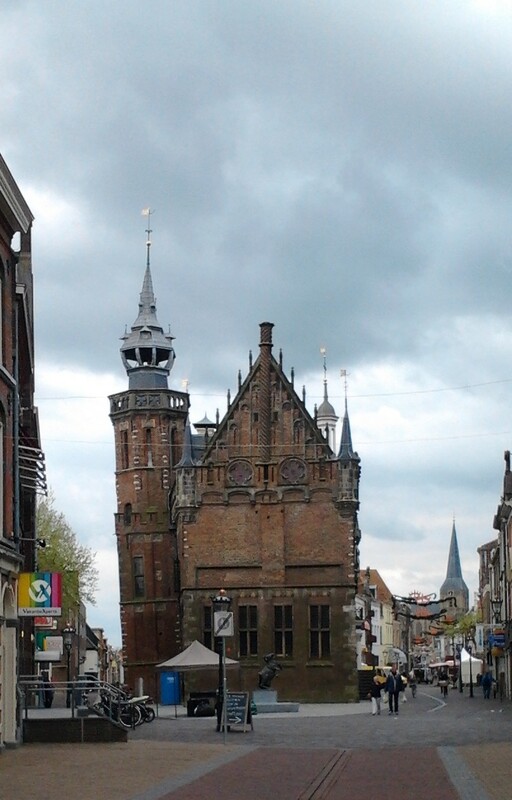 Kampen with its rich municipal archive would be a wonderful example to marvel at and to study again. This entry was posted in Buildings and tagged Legal history, Legal iconography, Netherlands on May 15, 2013 by rechtsgeschiedenis.